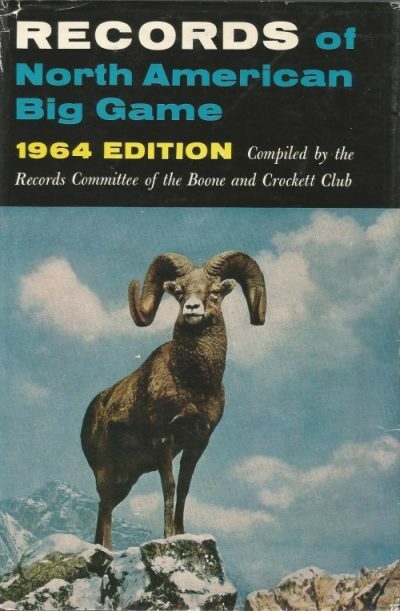 Records of North American Big Game: A Book of The Boone and Crockett Club Compiled by The Committee On Records of North American Big Game, 1964. Some of my fondest childhood memories revolve around long, broken-down rows of recently picked corn, their remnant tassels chattering nervously in the brisk autumn wind coming hard off of the Chesapeake Bay. We hunted geese there from pit blinds dug from the rich, black earth, surrounded by rafts of decoys as we peered hopefully into fast approaching storm. Waterfowl hunting, and especially goose hunting, is the high art of the gunning world. It requires dedication, intimate knowledge of the game at hand, and specialized skills acquired and honed over a long period of time. It is generational expertise not easily attained, most often passed down from close family or good friends. To be successful a hunter must be able to read the weather and the lay of the land, and place oneself if even for a moment in the eyes of a gander. One must present the perfect setup of form and function, in order to lure even the most gullible birds. You must speak their language too, for one wrong note can spoil the day. Patience, above all, is key, even when standing in ice-cold water up to your knees while trying to slow down the incessant chattering of your teeth. Bring it on, you say, all if it, for in the end there is nothing in the realm of mortals to match the thrill of cupped wings over the spread, sliding and swirling down over the gun as you tell yourself to stay calm and focus on a single bird. I can hear them now, honking and clawing, forever upwards towards the promise of a limitless, blue sky. With luck, and blessings, you can see them too. Here are a few photos from my hunt this fall in Eastern Colorado. As you can see, it was a very, very good day of goose hunting, and I wish you all, just one day, at least one day, like this too. There are many “firsts” in the life of a hunter. Who can forget their first BB gun, a first bow & arrow, or the satisfying heft of that first box of shotgun shells of their very own. And then there is the game to pursue. I cut my teeth on English Sparrows and Starlings, before graduating to a cadre of overeducated pigeons in our old dairy barn. Soon I became fairly good at thinning out our local rabbit and squirrel population, with thoughts of bobwhite on my mind. No, this is not the scene of some campy, dramatic flick, as mysterious and foreboding as it may sound. But it was the backdrop, with some poetic license included, of a monumental event in the big game hunting world. It is here, in 1899, that John Plute of Crested Butte, Colorado looked down his rifle barrel and laid down one of the largest set of elk antlers ever recorded. He has quite a history, this bull, and I can only imagine that his story only survives because of luck and some divine providence. It is said that Mr. Plute was a good hunter, and he often traded wild game for the goods that he needed. More than likely, he was usually not too concerned about the size of a bull’s headgear. Perhaps, in this case, he was. He was also known to be a colorful character. An inveterate bachelor, a miner, and a mountain man, he traded the head to the local saloon keeper in payment of an overdue bar bill. It later passed to the stepson of the saloon owner, who dragged it out of storage and submitted the first unofficial measurement of its antlers in 1955. The formalities took a little longer yet, until it was officially recognized by the Boone and Crockett Club as the new World’s Record Elk in 1961, The final score came in at a jaw-dropping 442 3/8 points. Photographs simply don’t convey the magnificence of this specimen, and you can barely fit it within the view finder anyway. In person it is very nearly overwhelming, and it takes some time to evaluate its true size as the eye struggles to gain perspective. The rack at its greatest spread tapes at over 51 inches, with 7 points on one side and 8 points on the other. One antler has a basal circumference of over 12 inches, and two points are more than 25 inches long. When first mounted many years after the kill, it was fitted with the biggest elk cape to be found. It was probably not quite big enough. I have been fortunate to hunt some of the nation’s top trophy areas, and I have come across some big bulls in my time. A 325″ class bull is bigger than many elk hunters will ever encounter; a 350″ elk will really get your attention. I have yet to ground check a Boone and Crockett class elk, though it has not been for lack of trying. Once, on a Colorado bowhunt, I very nearly harvested a bull that most certainly was approaching that magical 400 point plateau. The memory of that guy can still keep me up at night, and I doubt that I will ever forget the sense of awe he installed within me. I can hardly imagine another 40 or 50 inches of bone on top of his skull. The Plute bull was the World Record for over 30 years, and many thought that it would never be beaten. The glory days of elk hunting appeared to be long gone, after all, …or were they? In 1995, the elk hunting world shook once more when an antler buyer purchased a head that he had seen in the back of a pickup truck. Killed by an Arizona cattle rancher in 1968 and never measured, it was eventually determined to be bigger than the bull of Crested Butte. Even then, it only beat out the existing world record by less than 1/2″ of total score. Obviously, Mr. Plute never knew just how big his elk really was. It does not sound that it would have mattered much to him anyway, though I probably should not speak as if I know. Very little has been passed down about his everyday doings, or his end. Some have said that he died while breaking a spirited horse; others have said that no one really knows. Perhaps the truth of his ultimate fate is lost upon the winds and snow fields of the wild lands that he roamed, like many men of his era. In my way of thinking that only adds another layer to the legend, and to the mysterious nature of a place that once held a bull such as this. It is impossible to know the full extent of this elk’s legacy. No doubt his genetics still warms the blood of his countless descendants, banked for the day when they can fully express their immeasurable potential. Who knows how many elk like him, have lived, and died, without being seen? The head now hangs at The Crested Butte Chamber of Commerce, which might seem an ignominious end to such an important animal. Perhaps it may not be the best place to honor him, but I do not get to make that kind of choice. For most, he is a curiosity and a fine tourist attraction, though I doubt that the uninitiated can grasp its true significance. For my part I am grateful for the opportunity to admire him in any way that I can. The Dark Canyon of Anthracite Creek has yet to hit my eyes for real, but it will. I am drawn to it, curious too, and my hunter’s eye wants to see what it will see. Hunt there, I will, just to say that I did. I hope that John Plute would approve. Most of all, I would like to think that a giant elk like him still roams those mountains. In my dreams I see him there, hanging back in the dark timber just out of reach of mortal men, suspended on the edge of time and the longing of hunter’s soul. You Might Also Like The World Record Stag of the Woodlands, About Bowhunting For Woodland Caribou. If you would like to read more about trophy elk and mule deer, we suggest that you acquire a copy of Colorado’s Biggest Bucks and Bulls, by Jack and Susan Reneau. We generally have a copy or two in stock. Feel free to Email us at huntbook1@gmail.com for a price quote and other details. A TROUT OF A LIFETIME – UNTIL NEXT TIME! A big trout is an extraordinary creature – built for power, speed…and battle. Some, like this guy, are more than a match for any fisherman. May your waters be wild, and big! Fixins For Some Squirrel Pie! My friend and my brother and I used to hunt squirrels, and other game, on a game-filled property in the heart of the Maryland farm country. Things with wings were the main attraction, like ducks or mourning doves. Canada geese, however were the real lure that brought us there, and populations were on the upswing in the early 1970’s. The shooting was often truly extraordinary. The goose hunting was more than satisfying for our fathers and their friends, but not always enough for us. We were, after all, young boys bursting with inexhaustible momentum, and guns, and we badly needed something to do when the morning flights of Canada Geese had ended and the birds had laid up to rest. For me, it was not just a way to pass the time until the late afternoon hunt. Goose shooting is thrilling, and fun, but squirrels…now that’s a young hunter’s big game. Fortunately, the hardwood fingers between the cornfields and the backwaters of Chesapeake Bay were absolutely jammed with the elusive bushytails. We spent a lot of time still hunting through the autumn leaves, sharpening our eyes behind the rifle sights and practicing our future whitetail hunting skills. Squirrels fell all around us, though I doubt that we ever really put much of a dent in their numbers. They are, among so many things, a restless and boundless survivor in the long-term scheme of things. I miss those days spent within that colorful cathedral of canopy, slipping soundlessly around the trunks of tall trees with my chin pointed to the sky. Patience is a virtue in this game, as is focus and sharp eyesight. A flash here and a flash there was sometimes all you got, but sometimes, if you were lucky or good, you got a little more too. A squirrel’s head is a tiny target, and you could fancy yourself quite a marksman if you could drop one cleanly and quick. Long ago I graduated to hunting much bigger and more glamorous game, in places where the terrain and scenery could not be much more different from that gentle land. But those squirrels of my youth have never journeyed very far out of mind, and that is a good thing. I long to hunt squirrels. I crave those simple and rewarding days in the land of sassafras and scolding bluejays. Some are quick to say that the world moves on, and that you can never really revisit a time gone by. Perhaps that is true, but certainly not in all things. I would like to think that squirrel hunting is one of those. There are a number of hacks and subs you can do here. First, you can use any white meat for the filling. Rabbit, turkey, pheasant, quail, partridge and yes, chicken would all be fine. Next, you can skip the acorn flour and just use a whole wheat or some other darkish flour your like. Third, you can use regular walnuts for the black walnuts… or use whatever nut makes you happy. Mix the flours, baking powder and salt in a large bowl. In a small pot, heat the milk until it’s steaming, then turn off the heat. Stir in the fat until it’s mostly melted in; a few bits that aren’t melted are fine. Mix the wet ingredients into the dry with a fork until it’s a shaggy mass. Knead this all together until you have a smooth ball, then shape it into a cylinder. Wrap the dough in plastic wrap and set it in the fridge for at least 2 hours and up to overnight. Heat the bacon fat in a large pan over medium-high heat and add the cabbage and onions. Saute until softened, about 6 to 8 minutes. Salt this as it cooks. Add the squirrel meat, apple, walnuts and Cavender’s seasoning (or black pepper), stir well and cook for a few minutes. Stir the sorghum syrup in with the stock until combined, then pour this into the pan with everything else. Stir this well and let it cook another few minutes so the ingredients absorb the liquid. Turn off the heat and let the filling cool. If you have a tortilla press, get it out and cut a heavy plastic bag apart to make two plastic sheets that you’ll use to keep the dough off the metal of the press. If you don’t have a press, lay out a work space and flour it well. Cut the dough into anywhere between 8 and 10 pieces, trying to keep them about the same size. Put half the pieces back in the fridge. Roll a piece into a flat, disc and set it on a piece of plastic on the press. Put the other piece of plastic over it and squash the dough into a thin disc. I find that I do one squeeze, then adjust the dough so it’s perfectly centered in the tortilla press. If you don’t have a press, roll the dough balls into flat discs about 1/8 of an inch thick. Remove the dough from the plastic and put about 1/4 cup of filling on one side of the disc. Sprinkle some shredded cheese on top if you’d like. Fold over the dough to make a half-moon and seal. Crimp the edges with a fork and set on a floured baking sheet. Repeat with the rest of the dough. Bake at 400F for 25 minutes. Move to a cooling rack for about 10 minutes before you eat them. Best served hot, but they’ll keep for a week or so in the fridge and are pretty good cold, too. NOTE: I start with meat shredded off squirrels used in making stock. You can do this, or braise squirrels in salty water until tender, or you can just cut meat off the bones of raw squirrels and chop that up. All methods will work. The hunter pussyfooting through the squirrel woods is not seeking a trophy animal, is not concerned about the behavior of an expensive bird dog, nor is he attempting to impress a hunting partner with his wingshooting. He is in the hardwoods for the pure joy of hunting…” –By Bob Gooch, Found in All About Small-Game Hunting in America. Edited by Russell Tinsley. Published by Macmillan, 1984. Very Good condition in Very Good Dustjacket. Feel Free To Email Us At huntbook1@gmail.com for Details. Big Mule Deer bucks are experts at stealth, evasion, and concealment, and they always seem to completely vanish during the annual rifle seasons. I have watched this guy come along for several years now, and he has returned once again to his favorite doe-chasing country on unhunted, private lands. A battered old warrior, for sure, and a survivor of bears, mountain lions, and the relentless coyote hoards. He may be even bigger than ever, certainly taller, but not wider, and perhaps just a bit on the downside of his prime. Still, he seems unchallenged among his competitors, though no doubt, some will run the gauntlet of horns before the end of the current breeding season. My guess is he will die of old age before some lucky hunter can surprise him in his transitional haunts, if, in fact, they be anywhere where he could be legally hunted. I should know, for I have tried. But there is hope, there is always hope…and there is always, God Willing, next year! Todd and Ian Dean pose with dad’s trophy bull. For Todd, it is a fitting end to a 26 year quest to draw a tag in one of Colorado’s Best Game Management Units. I can’t wait to hear more of the story, but it certainly looks like it was well worth the wait. Congratulations Todd. If anyone deserves a great bull elk, that would be you! We were all young once too!